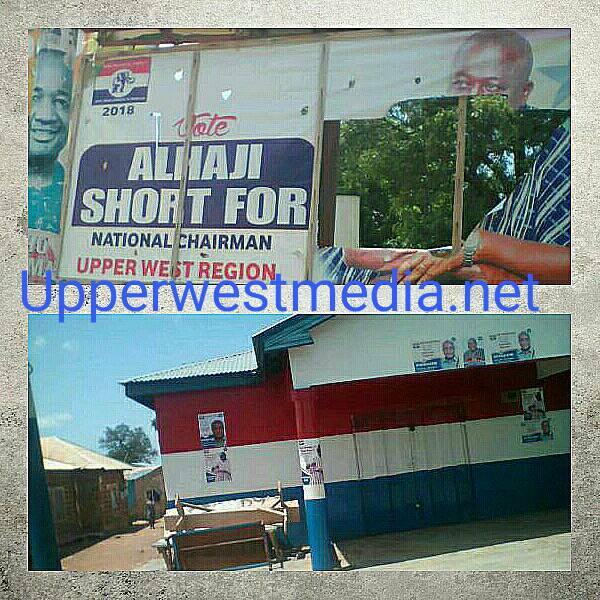 Following a keen observation of Wa Municipality, the battle for NPP’s National Chairmanship slot has appeared on stickers and banners with so many messages from some number of candidates including the former Regional Chairman, Alhaji Abubakari Rahman whose motto is ‘Asempa ye Short’. Checks carried out at the refurbished Party office situated in Jangbeyiri, the home of the Former Chairman showed stickers of a national candidate, Stephen Ntim who recently referred to Alhaji Short as a stranger in The Party he[Ntim] will never step down for. One would have expected stickers from Alhaji short flooding Jangbeyiri, his home rather than his opponent who verbally assaulted him in an Interview. Other Pictures on the walls of the office were that of Kangberee. Further checks at Jangbeyiri to gather information proved the Residents were disappointed with the reluctant mode with which Alhassan Sulemana, the Regional Minister’s Issue was handled after his suspension by the then Regional executives chaired by Alhaji short. Further Checks around town showed another picture of the aspiring Chairman located close to ministries torn. Sources suggested it could be due to the decision to take sides during the regional elections which didn’t favor his team, the government team as Declared by the Deputy regional minister, Chinnia in an audio lately. Alhaji Short will be contesting for the national Chairmanship of The New Patriotic Party alongside Stephen Ntim and Fredy Blay. The Elections was postponed to July due to the Idul-Fitr and Ramadan fasting. May 14, 2018 in News. I am highly disappointed in your cheap style of journalism.